WIN A $20 BOOK VOUCHER! Download an entry form from the magazine’s website (and you can read the terms and conditions there, too). Warm up those typing fingers—here’s a competition for 8 to 12 year olds in WA. 720 ABC Perth are calling for entries of short stories of no more than 500 words with the trigger of RADIO. Radio must be incorporated somewhere in all stories—whether it is a major part of the story, or it is literally mentioned in the story, it must be featured in some way. And there are some amazing prizes! MAJOR PRIZE: Return flights and accommodation to Melbourne (ex-Perth) for the winner and a parent or guardian (includes transfers and meals), $50 spending money, a day of tours at Scienceworks, the National Sports Museum and Melbourne Zoo, special guest representing WA as the Young Reading Champion at the National Reading Hour in Federation Square. 2nd PRIZE: Your height in books! The competition closes on 5 August 2012. Check out the 720 website for more details and info on how to enter. Unexpected Guests at Grandma’s House! Alphabet Soup will be turning THREE in October. Hip hip hooray! So, we’ve decided to have a three-themed writing competition for our spring issue. Write your own tale about The Three Little______ (choose your own characters). Your story should be no longer than 450 words and shorter is fine. Include a competition entry form. This may be printed from the website (see competition rules), photocopied, or contact us to have one emailed or posted to you. Your entry can be handwritten or typed. Make sure you read the competition rules! Don’t forget our Design-a-cover competition closes on 16 September 2011. The winning entry will be used for the cover of our summer issue. Check out our designing tips here. Closing date: 19 August 2011. Here’s a competition open to NSW students aged 12 and under. Write a story called ‘STUCK AT HOME IN MY PJs’. For competition entry details, visit the Asthma Foundation NSW website. Good luck! 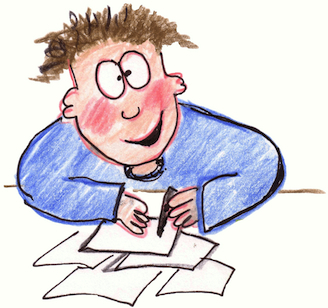 A good way to hone your writing skills is to enter a writing competition. You won’t always win, of course, but it’s a good way to get motivated, get ideas and get writing! Keep an eye on the closing dates, and remember to read the guidelines. Judges hate it when they read a fabulous story or poem and they can’t award it a prize because it was longer than the word limit, or didn’t stick to a rule listed on the entry form. Here are some upcoming competitions for kids. Do you know of any other writing competitions for kids? The autumn writing competition for kids! Issue 6 will be available on Monday 22 February 2010. Subscribe via the Alphabet Soup website!